The Bebamour New Style Baby Carrier is a unique baby carrier that offers a variety of carrying positions for a great price. It also offers a different approach to carrying: the hip seat. It supports baby from underneath and keeps baby’s hips in the desired M-position for proper hip development. This also keeps most of the weight distributed on parent’s waist belt, great for those who have back or shoulder problems. It will last from day one until age 3 or 4 (44 pounds) and is comfortable for both parents and babies. This carrier is a great bargain buy and hangs up there with the more expensive carriers on the market! 3 EASE OF USE | Very Versatile! The Bebamour New Style Baby Carrier is a unique baby carrier that offers a variety of carrying positions for a great price. The Bebamour New Style Baby Carrier puts a different spin on baby carriers. Unlike other carriers we’ve reviewed, the Bebamour supports baby’s bottom using a foam seat instead of being support from above. This puts less weight on parents’ shoulders, too, and distributes it more so in the waist, providing a better option for parents who might have back or shoulder problems. This seat is ergonomically designed to support baby’s legs and hips. The hip seat is a great safety feature for your little one, too. This seat is ergonomically designed to support baby’s legs and hips. By supporting the legs properly, this puts baby at less risk for hip dysplasia. The Bebamour New Style Baby Carrier also does a great job of keeping baby’s hips positioned properly in the front outward carry position, a feat where many other baby carriers fall short. This makes for a safe and fun outward carry position for baby. A couple downfalls to the safety design of the Bebamour New Style Baby Carrier are the material and the hip seat when used solo. The material is 100% polyester, and there are no claims that it is made without any harmful chemicals or fire retardants, so be aware that these may be included in the material on this carrier. Polyester is also known for its lack of breathability. Also, the hip seat when used without the rest of the carrier (it’s detachable) doesn’t provide enough support to be safe for baby carrying, so it’s important to be careful when carrying baby using JUST the hip seat, as there’s not much support. Comfort is a top design feature for the Bebamour New Style Baby Carrier. Even though it’s made of 100% polyester, there are hundreds of vacuum holes that optimize air circulation, making it breathable and airy enough even for hot weather. The frame of the Bebamour is thin and not as bulky as other carriers on the market. However, the hip seat is the bulkier part of the carrier. The top feature of the Bebamour New Style Baby Carrier is the foam seat that baby sits his cute little tush on during carrying. The foam seat is attached to parents waist belt which attaches to the rest of the carrier by a zipper and buckles. This makes the waist belt removable from the rest of the carrier and distributes most of baby’s weight on the waist belt instead of the shoulder straps making it a good carrier for parents with back problems. 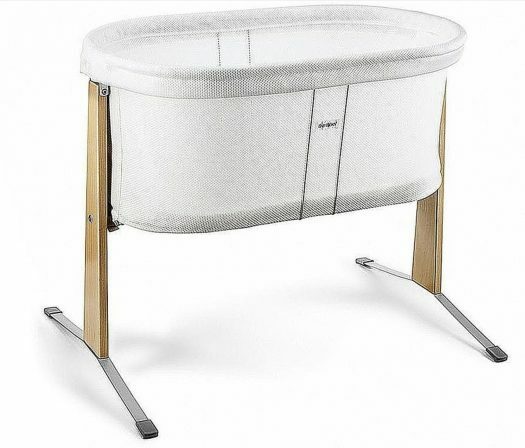 The hip seat provides a different type of support than other carriers we’ve reviewed and distributes more of baby’s weight on parent’s hips. 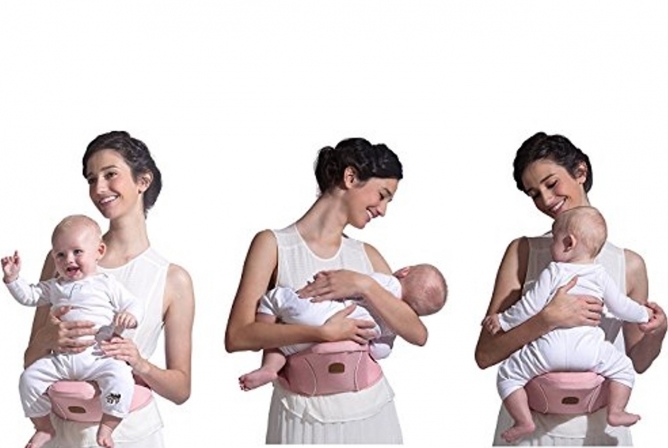 Because of this, some parents have stated that due to the lack of padding on the parent waist belt, this carrier can dig in a little more than desired. Yet, there is good shoulder padding and nice soft padding where baby’s head rests. EASE OF USE | Very Versatile! Another great feature of the Bebamour New Style Baby Carrier is its versatility and various carry positions. It can be used straight from birth up to 44 pounds and doesn’t need an infant insert, which should be used wisely, because there could be potential for lack of body support for newborns. We’ve found that the higher quality carriers require an infant insert because safety is their top priority. Therefore, some parents have stated that there is a lack of support for smaller babies, and the sides of the carrier are quite open, creating a hazard for newborns and small babies to possible wiggle out of the carrier. The Bebamour New Style Baby Carrier also claims to have 6 different carry positions, but hold on while we break this claim down a little more. 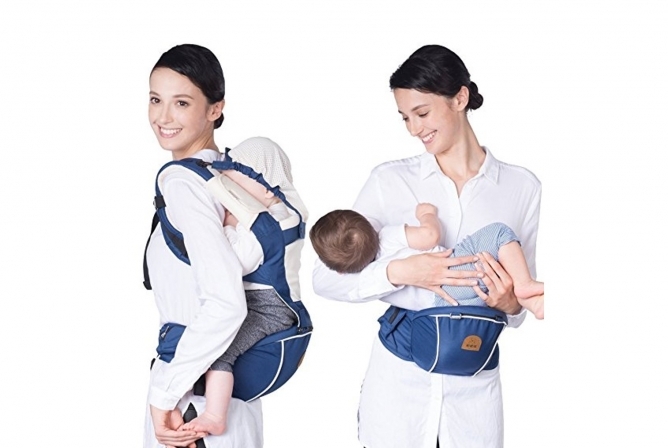 Two of the 6 different carry positions require parents to actually hold the kiddo with some slight support of the hip seat. So because parents have to essentially hold their baby with the support of the hip seat, the Bebamour truly only has 4 carry positions. However, 4 carry positions still provide a great bit of versatility, very similar to the Ergobaby 360 carrier, but with a lot more bulk. To add to the versatility, the Bebamour comes in 3 different colors and can be worn by anyone due to adjustable straps. Design is very similar to other carriers we’ve reviewed in that baby insertion is the same. The Bebamour New Style Baby Carrier can be put on by one person (most of the time) and secures with a buckle on the upper back. The straps are easy to adjust, and the buckles are pretty easy to reach. Some parents have had problems buckling the back buckle when trying to secure baby in the front outward carry position. There are some nice little storage pockets on the sides of the waist belt that are great for small personal items like money and phones, but not much else. The waist belt and hip seat design make this carrier great for parents who might have back problems, as most of baby’s weight is distributed across the waist. 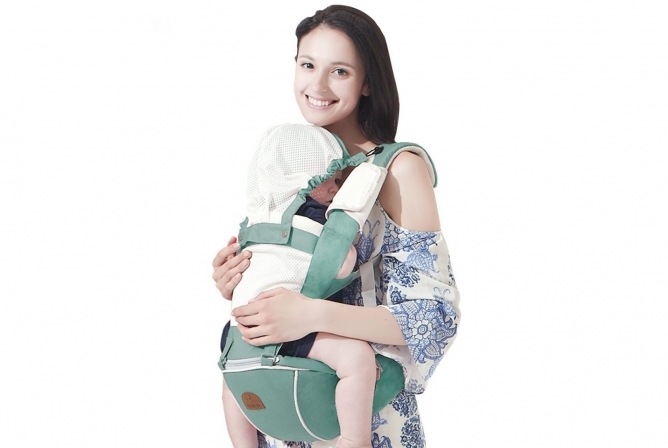 However, the hip seat makes the Bebamour New Style Baby Carrier a little bulky, which could make this carrier more difficult to wear for those with smaller frames. This carrier claims to have 6 carry positions, but like stated above, 3 of those positions include parents actually holding baby with the hip seat providing some support, but not much. Also, these two positions require the rest of the frame of the Bebamour to be removed, which provides no support for the waist belt, causing it to slide down and become ineffective. So in all reality, this carrier only has 4 carry positions. The 3 carry positions are very similar to other carriers we’ve reviewed, including front inward facing (3-36 months), front forward facing (3-36 months), and back inward facing (6-36 months). All of these carry positions keep baby’s hips in the perfect M-position, or froggy position. The fabric is also breathable due to hundreds of vacuum holes that optimize ventilation and breathability for both baby and parent. Even though the Bebamour New Style Baby Carrier is 100% polyester, its frame is still lightweight and less bulky than other carriers. 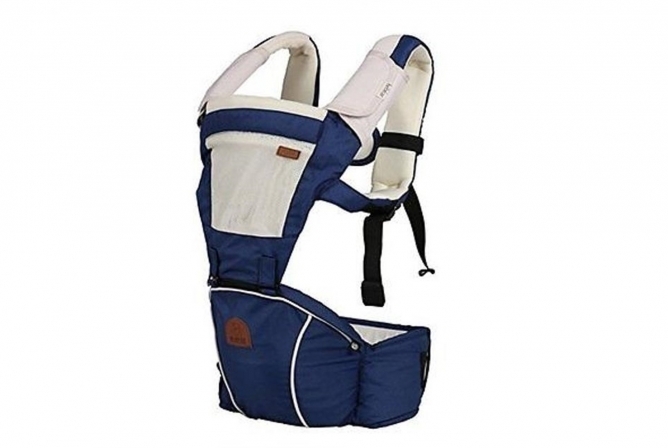 The hip seat is the only thing that makes this carrier bulky in the waist area. Longevity for the Bebamour New Style Baby Carrier is pretty good, made to last for kiddos up to 44 pounds. This can easily include a toddler between 3-4 years, perfect for long days at amusement parks or during other activities where you have to keep a close eye on your kiddo. The various carry options provide entertainment for little ones, allowing parents to get better use out of the Bebamour as it allows children to stay entertained. Price is very affordable and provides a lot of versatility for those on a tighter budget. Some of the carriers that tend to have more carry positions run a little higher price-wise, so the Bebamour New Style Baby Carrier is a great choice for those looking for a well-rounded but a lower priced carrier. There are a few features that will lack with the lower price, however, like extra padding and more quality material and design. Also, many pictures show a babyhood included, and this does NOT come with. The babyhood needs to be purchased separately, which is a little deceiving. Price (Check Price Here!) is very affordable and provides a lot of versatility for those on a tighter budget. The Bebamour New Style Baby Carrier is a unique baby carrier that offers a variety of carrying positions for a great price. Sometimes baby carriers that offer a wide range of carrying positions tend to run on the pricier side. It also offers a different approach to carrying: the hip seat. It supports baby from underneath and keeps baby’s hips in the desired M-position for proper hip development. This also keeps most of the weight distributed on parent’s waist belt, great for those who have back or shoulder problems. Even though the quality is a little lacking in material, and the hip seat is a little bulky (especially for more petite carriers), the Bebamour is quite the deal. It will last from day one until age 3 or 4 (44 pounds) and is comfortable for both parents and babies. This carrier is a great bargain buy and hangs up there with the more expensive carriers on the market!